Do you remember the last time you were “the new kid on the block”? Maybe you started a new job, moved into a new neighborhood or joined a new club or organization. Even as an adult, you experience that weird combination of feeling like everyone knows who you are because you are NEW, but feeling invisible (and lonely) at the same time. Starting a blog and joining the blogging community is a little like this. You create this presence in cyberspace and pour yourself into it, feeling very NEW and awkward at what you are doing; wondering if anyone knows you’re there or cares. I’ve only been writing here for seven months. A variety of readers have stopped by and some have been repeat visitors, which is so encouraging! But I felt like the new girl at school being invited to join a group eating together in the lunchroom when I was recognized by a fellow blogger, Maddie Cochere, of Breezy Books. 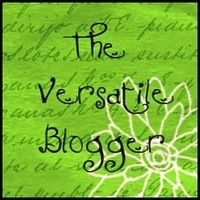 Maddie nominated me for one of her blogging awards, The Versatile Blogger. I’ve learned a lot about blogging by reading her blog as well as some others. One of the nicest things about the bloggers I’ve come across on WordPress is that they “call each other out”, but in a complimentary way. They link to other bloggers, which encourages the reader to go check out that person as well. They help each other, encourage each other and basically treat each other the way we should treat anyone who is new to our community. I love to laugh and am the first to admit my sense of humor is a little “off”. I like to sing. My car is my studio. I am an avid reader – four eyes would be so helpful! I like to bake sweet things and then share them with others so I don’t eat them all myself. I enjoy watching college basketball (which I am doing as I write this). Those terrible commercials with the pets behind bars, unadopted, about to be put down, make me cry. I love a who-done-it, action packed, murder mystery movie. In addition, I’m supposed to nominate 15 other bloggers for this award. I have to ask forgiveness on this one because I don’t have enough time to read 15 other bloggers! I think that will be my goal for this year – work on getting to know 15 new people through their writing and making a point to “call them out” here – doing my part to help build the community. Halloween has taken such a beating it’s barely recognizable these days. I have great childhood memories of Halloween. I was one of four children and mom helped us make our costumes every year. We were ghosts, cats, superman, whatever we could dream up and put together with a minimal amount of sewing. One year my brother begged and begged to go as a gorilla. Of course, he wanted to use mom’s fur coat as his costume. That didn’t happen. As teenagers, he and I rigged up a great scare experience for trick-or-treaters. We lived in a two story house. My parents’ bathroom window was right over the front porch steps. 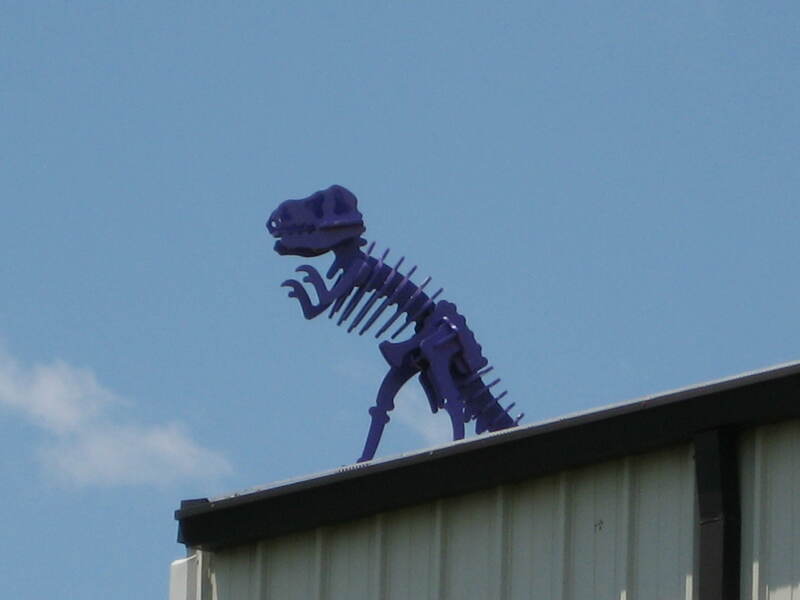 There was a small roof ledge there. So we made a ghost and tied a rope around its neck, long enough for the ghost to hang almost to the top of the front steps. Then we brought the portable record player into the bathroom. We hooked up a small speaker and put that on the roof ledge just outside the window. Mom had a great Halloween sound effects album – creaking door noises, moans, screams, etc. With the lights out, record player on, and the window open we waited for our prey. As little children would come up the front walkway, we’d put the needle on the album, turn up the volume and then, just as they got to the first step, we’d throw the ghost out the window and it would land right in front of them. They’d scream and turn and run back to their parents waiting at the curb (nursing their mixed drinks). We had a blast! I think we had candy left in the bowl that year. 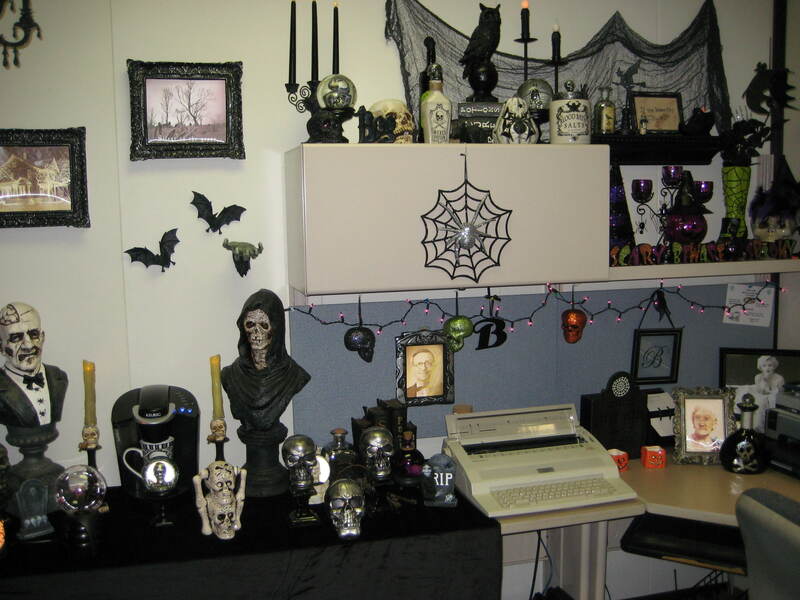 I have a co-worker who loves Halloween and she has gone all out this year decorating her office. As she explained to me when I asked her, “Why?” – her home is in the woods and she has a long dark driveway. Her children are grown and out of the house and no one comes for trick or treating anymore. So she is celebrating at work. 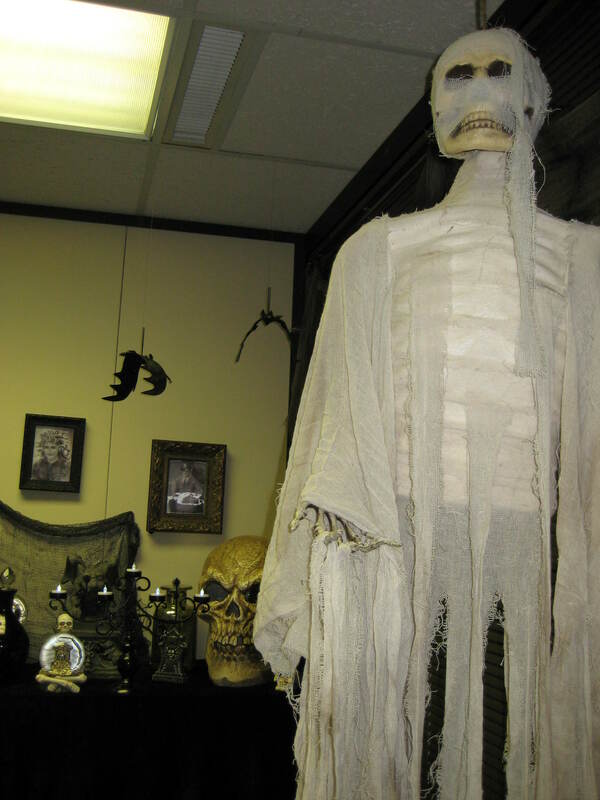 There are spiders, 18 skulls of various shapes and sizes, gravestones, bats, ravens, a hanging lady, webbing, and scary people pictures on the walls. Best of all, there are 3 cauldrons of candy – one with candy corn, one with mints and one with mini candy bars. Staff love it! They have brought their children and grandchildren by to see the decorations. Coworkers who never poked their heads in her doorway come by to say “hello’ and get a piece of candy. It has been a much needed morale booster. Do you do something fun or crazy for Halloween? Share! We still have time left for fun before November 1.